Gary began in 1995 by brewing in a rented aluminum pot on the floor of the garage. He used a old hot water heater burner connected to the natural gas pipe from the dryer. The burner sat in the middle of a ring of bricks with the kettle on top. The propane burner is connected to a 7 inch pipe. This is attached to a steel stand that holds the stainless steel keg that he uses a brew kettle. Three keg, all-grain (full mash) RIMS system. This is controlled by a basic stamp microprocessor. Mashing is the process of mixing your milled grain with hot water and letting the mixture rest for a period of time. Enzymes found naturally occurring in the grain are activated by the heat and water so that they begin to break down the starches within the grain into sugars, so that the yeast can ferment into beer. While there are different ways to get the mixture of water and grain to the proper temperature, this particular method of mashing (heat water, mix with grains, let rest) is called infusion mashing. 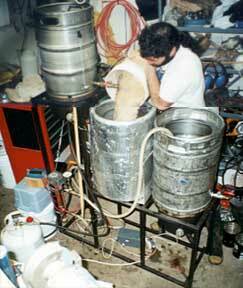 Because of its simplicity it is the preferred method of many homebrewers. Therefore, many all-grain homebrewers are just two steps away from a RIMS. By adding a pump to your mashing vessel (mash tun) and recirculating the wort as you mash, and a heat source to keep the mash at the target temperature, you will have created a RIMS. I am able to automatically control the temperature of the recirculating wort with the addition of a home-built microprocessor controlled heating element. By placing electronic temperature probes in the plumbing, and then connecting these probes to the microprocessor and heating element, this system is able to measure the temperature of the recirculating wort and control the heating element accordingly. I am able to dial in a target temperature and a time to reach that temperature, the system will bring the mash to the target temperature in the specific time without overshooting the target temperature. The system will then maintain this set temperature without any need for manual intervention. painter's blue tape holding LCD display. 6. Inserting return manifold into mash tun. 7. After starch conversion is complete, the wort is transferred to the boiling kettle. 8. Getting a sample for measuring specific gravity this info will be used after fermentation to determine the alcohol content.